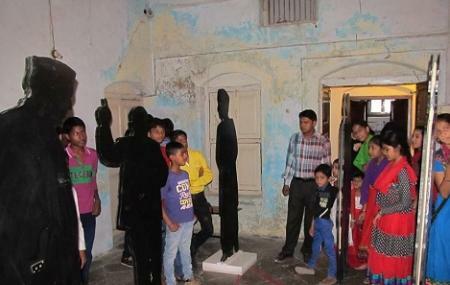 It is an interesting and one of a kind museum in Ahmedabad which quietly sits in the Mirzapur area of the city and beckons visitors from all over the world to come here and witness its artefacts. The place is based on the theme conflict, hence most of the items displayed here revolves around it. The museum is for thinkers, change-bringers and those who don’t shy away from the greys of the society. It will enlighten you on the various conflicts of the past and prompt you to mull over it. The place has a serene ambience that goes well with the theme and as your rummage your brain, while checking it all, soaking all in, you realise that it has left a lasting impression on you. A must come for curious souls. People normally club together City Museum and Shree Mahalaxmi Temple while planning their visit to Conflictorium. It's interesting how they are trying to portrait the concept of "Conflict" but I feel some sections could be a little bit more self explanatory. The animal metaphor and the initial timeline were very nice and informative. All together different kind of museum ,very unique concept.liked the audio visual guides . One of the best museum in Ahmedabad. A friend and colleague asked me to visit the place without giving any background. Initially I was confused, apprehensive and amused, but as I spent time I felt satisfied and liberated. At conflictorium time flies. Art work that is on display is exceptional and the writing on the wall pushes you think out of the box. You get absorbed in the space and paintings transforms you to the world that is unknown to you. Must visit place for every human being. Brilliant concept. One of the most evocative museums I've been to. It's a hidden gem!